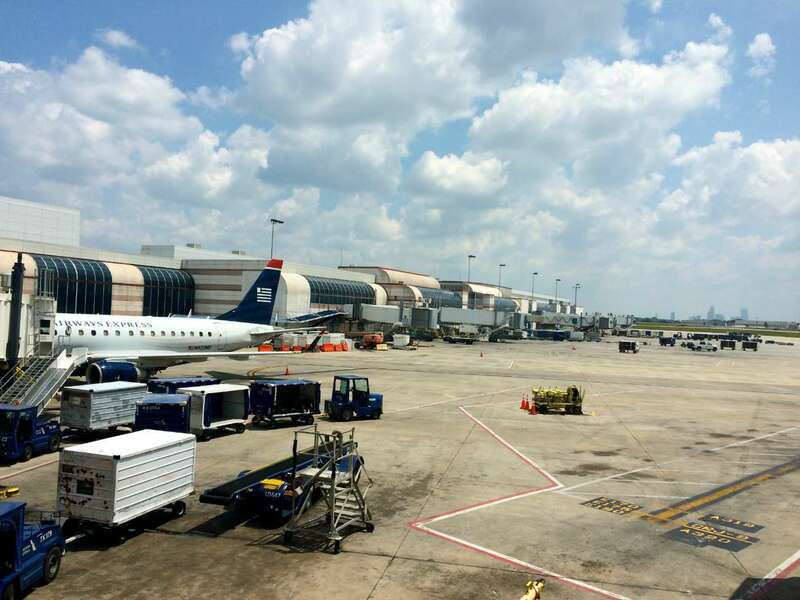 Has Charlotte Douglas International Airport ever not been under construction? It sure feels like our airport — the nation’s sixth-busiest by takeoffs and landings — has been continually inhabited by cranes and orange cones for most of the past decade. 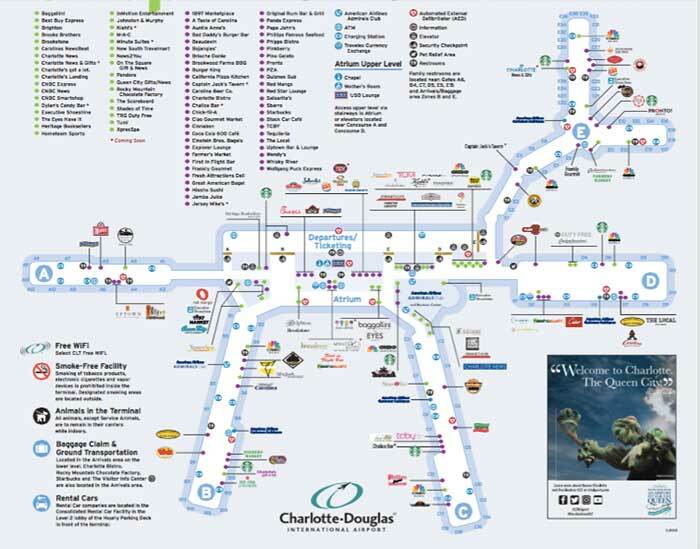 Just three years ago, CLT finished up its $1.5 billion 2015 development plan. 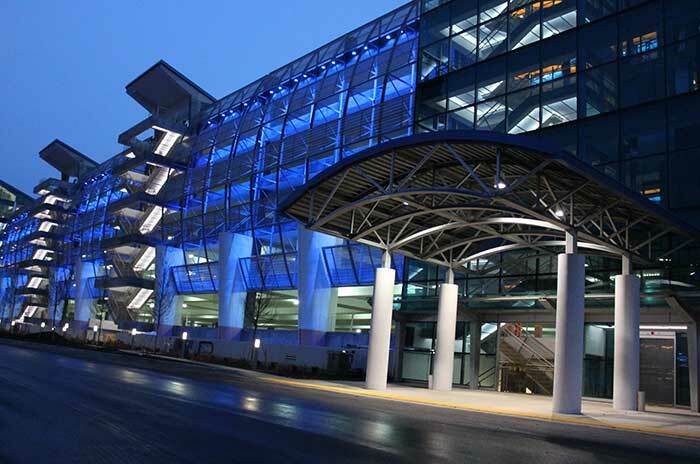 This added a new hourly parking deck, entrance road, food court and rental car facility. Now the city of Charlotte is executing on an even bigger and more expensive round of construction. 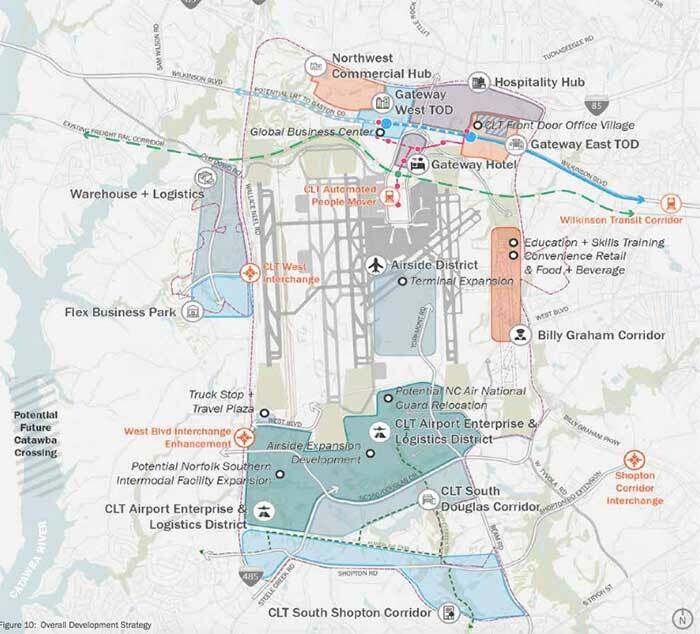 The $2.5 billion plan known as Destination CLT is designed to add more capacity for passengers, planes and global commerce. There are a lot of minor changes happening all the time: New flooring in on Concourse B, new display screens, new animal relief areas, new restaurants, and a NoDa Brewing taproom. But here’s a look at some of the major renovations and construction projects underway right now. Nearly all of the terminals and concourses are getting some sort of upgrade. Work should all be wrapped up by 2020. I know this map is hard to use, but just focus on the big letters in the blue circles. Those designate the concourses. The one closest to being done is the $200 million Concourse A expansion. It will add nine gates, to be used by United, Southwest, JetBlue, Frontier and Air Canada. This month, the airport has been installing passenger boarding bridges. It should be all finished up this summer. Construction on the Concourse A expansion. Photo published May 14, 2018 by Charlotte Douglas International Airport on Facebook. 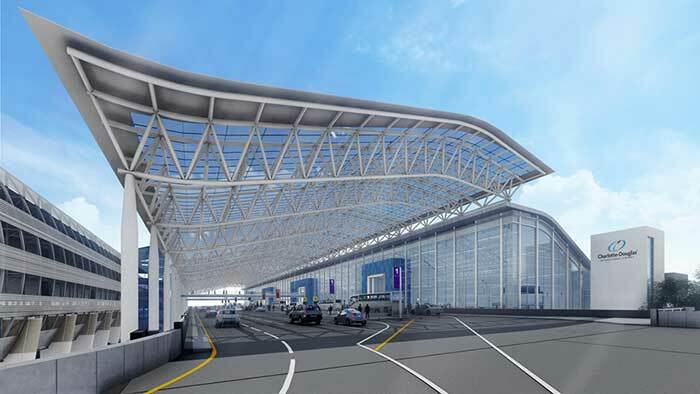 Then there are the East Terminal and Concourse E expansion projects. Both expected to wrap up in summer 2019. 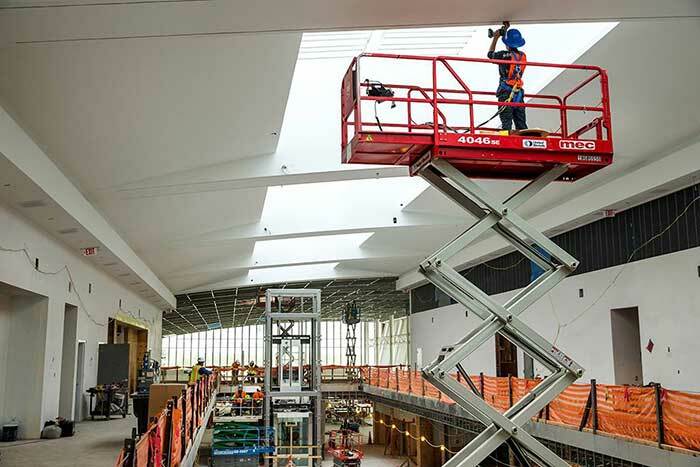 The East Terminal project will cost $29 million and add 51,000 square feet across three levels at Concourses D and E. Also look for a “mother’s room” and children’s play area. 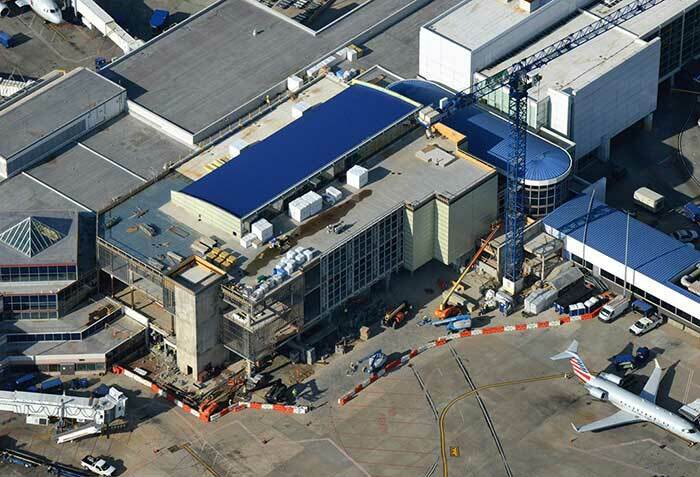 East terminal expansion construction in late April 2018. Photo by Charlotte Douglas International Airport via Facebook. The Concourse E expansion project is mostly designed to alleviate congestion. The $30 million project should be done by summer 2019. 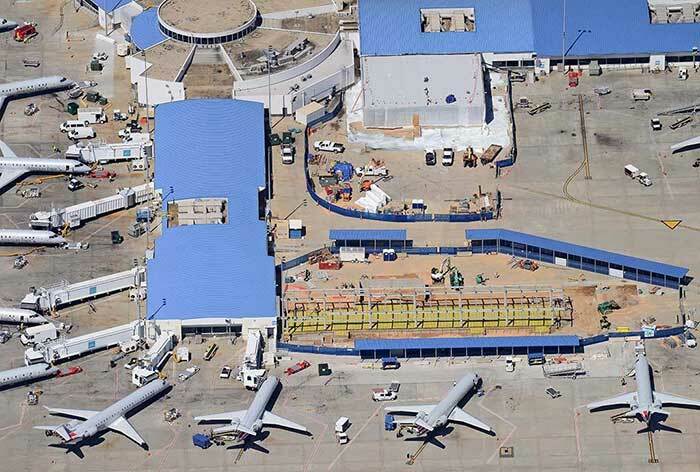 Construction on Concourse E as seen from the air. Photo taken in early May 2018 by Charlotte Douglas International Airport via Facebook. 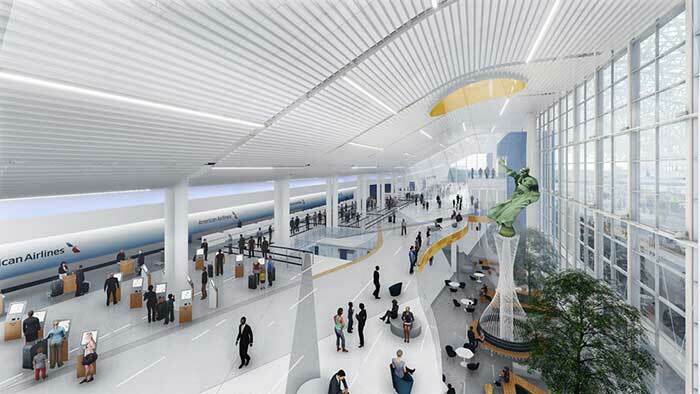 The most dramatic will be the terminal lobby expansion and renovation. This $300 million project won’t be done until 2020, but it will give the three-decade-old building a major facelift. There will be more security lanes, ticketing and baggage claim areas. 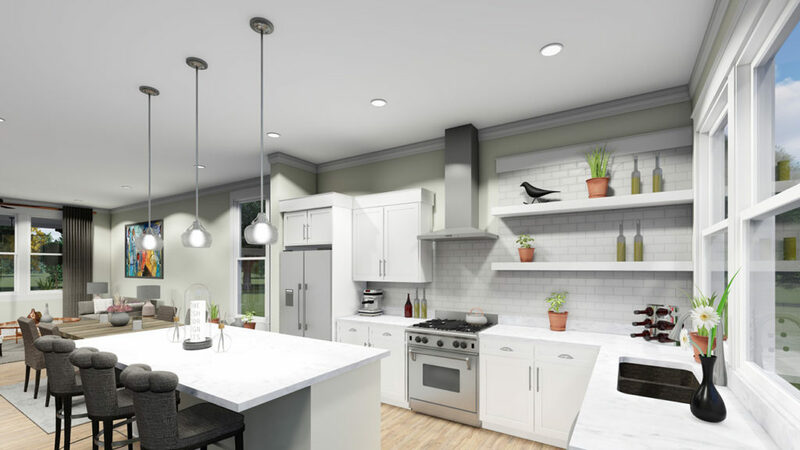 Rendering by Gresham Smith and Partners. One big one that everyone will see will be finishing up fall 2018. Known as the “Elevated Roadway and Terminal Curb Front” project, this $50 million endeavor will add more lanes for cars picking up and dropping off and add sky bridges for people walking to the parking decks. 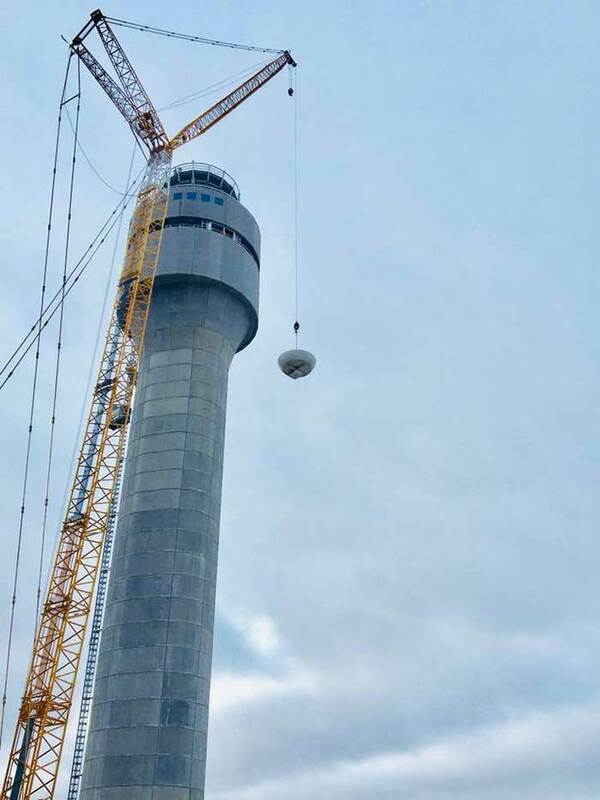 The airport topped out a new 370-foot air traffic control tower in March 2018. Photo by the FAA via Facebook. There are also plans in the works to build a fourth parallel runway that will allow for more takeoffs and landings. The airport and the FAA are in the environmental impact study phase of this project. Overall, it will cost $422 million and won’t be done until 2022 or later. For years, the airport has acquired land immediately around it. A lot of the time, homeowners are happy to move to get away from jet noise. But CLT also has bigger aims for all the land around its borders. 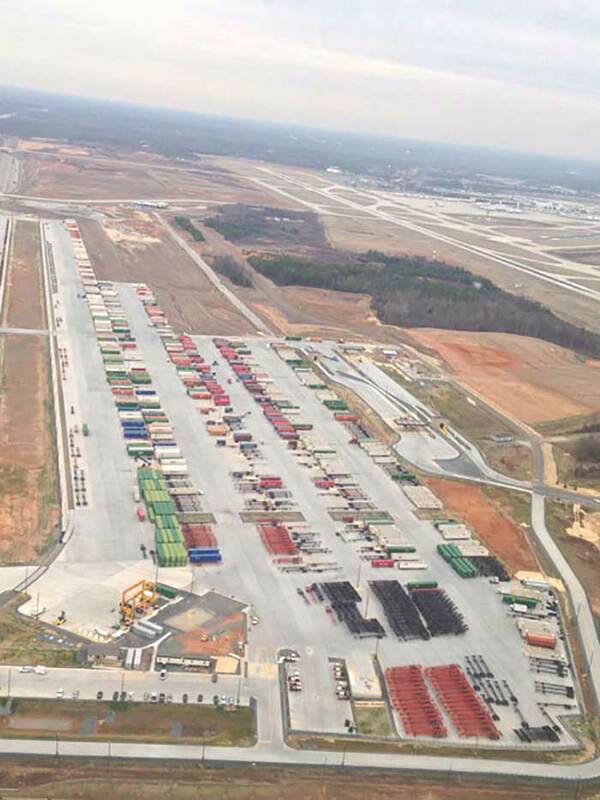 A recent master plan envisions creating a global hub for manufacturing, warehousing, transportation, trucking and distribution businesses — all centered around the 6,000 acres near the airport. The airport already owns nearly 700 acres and has plans for a business park, multiple hotels with a total of 1,100 rooms, industrial space, warehouses and retail. All this would take 20 years to build out. Then there are grander ideas for “airport connected development” all around it. All this builds on the $200 million Charlotte Regional Intermodal Facility that Norfolk Southern recently built near the airport. It transfers cargo between trucks and trains. Already there are ideas to expand the concourses even further. Another $300 million project to add 16 gates to Concourse A won’t be designed until next year. Twin $463 million projects to add a dozen gates to Concourse C and Concourse B will be designed in 2021 or 2022. All three projects won’t be finalized until 2023 to 2026. Tired of construction? We’re just getting started.